A tank holding a flammable chemical at a Texas plant exploded and caught fire, leaving one worker killed and two others critically injured on Tuesday, April 2, authorities have confirmed. The fatality was confirmed by Harris County Sheriff Ed Gonzalez who told local media that the two injured were rushed to a hospital by helicopter. A spokeswoman for the Harris County Fire Marshal’s Office, Rachel Moreno, that the two injured were in critical condition. According to the authorities, a transfer line ignited in a tank of isobutylene which then caught on fire. Isobutylene is a colorless flammable gas mostly be used in the production of high octane gasoline. 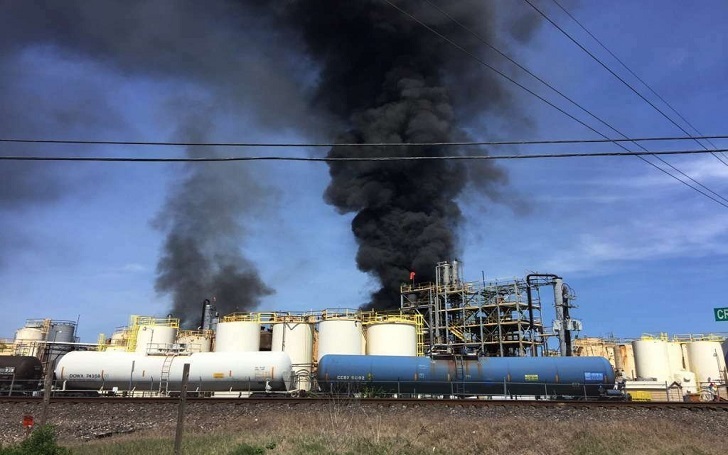 After the fire broke out, authorities shut down a nearby roadway at the KMCO chemical plant in Crosby. The company offers coolant, brake fluid products and chemicals for the oilfield industry. First responders were trying to extinguish the fire. The chief executive of KMCO, John C. Foley, released a statement saying that the company activated an emergency response team and set up a command center. Everyone in the company reportedly had to jump over a fence to escape as all the gates were locked. Residents within a one-mile radius of the chemical plant were told to stay indoors or shelter in place.